Innovation is rooted within Jewish thought, prayer, and action. 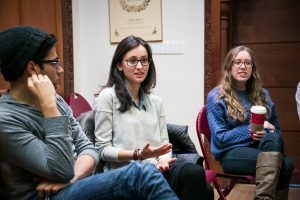 In the current age of entrepreneurship and creativity, Jewish social entrepreneurs are building everyday, creating ventures that address our community’s biggest needs. We want to support the innovators of our community. Online Application – request an application via Get Involved. 2018 applications are currently closed, and will reopen Spring 2019. Accelerator entrepreneurs will participate in in-person and virtual training, as well as cohort town-halls. Course topics include: leadership, organizational clarity, fundraising, storytelling, operations, and more. Entrepreneurs will also work with lay leader professionals and OU experts to develop customized training to accelerate their ventures. We'll let you know about the next application cycle, upcoming events, and more. © 2019 by OU Impact Accelerator.